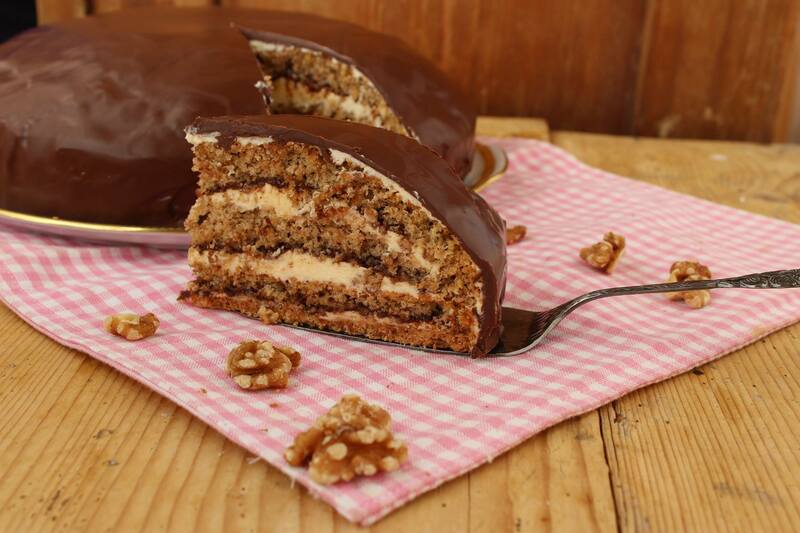 The German layered walnut cake is dome shaped and it is not that difficult yo make such a special cake. It is easier then you might think. There are no special ingredients needed, we provide the recipe for vanilla pudding and even for vanilla sugar. This cake will be the final center piece for your holiday menu. 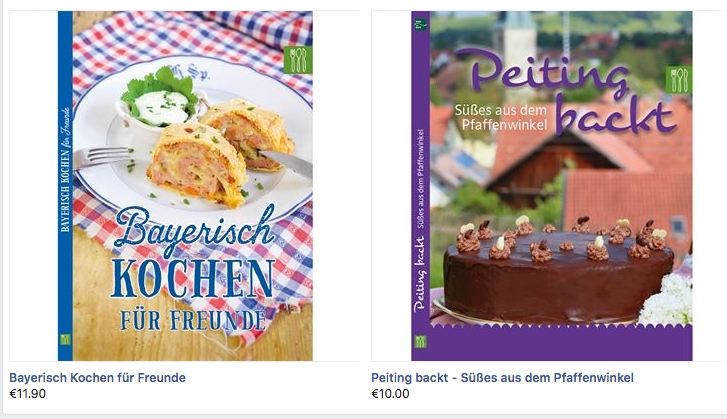 Special thanks goes to the German ladies who created this cake and allowed to publish it - Check out the link at the bottom - diehauswirtschfterei.de - Happy Baking! 1. For the Biscuit Cake mix eggs with sugar until foamy. Combine flour with baking powder and ground walnuts, mix with eggs. Layer a 26cm (9") springform with baking paper, spread dough into form. 2. For the Short Crust mix all ingredients. Grease a springform of 28cm (10"), place dough onto the form and bake for 10 min on 390 F (200 C). 3. For the Butter Cream Filling make the pudding per instructions, place plastic foil on top (prevents skin build up), let cool off. Combine butter with powdered sugar until foamy, fold in pudding spoon by spoon. Mix well, keep 5 tbsp of the cream in the fridge. 4. 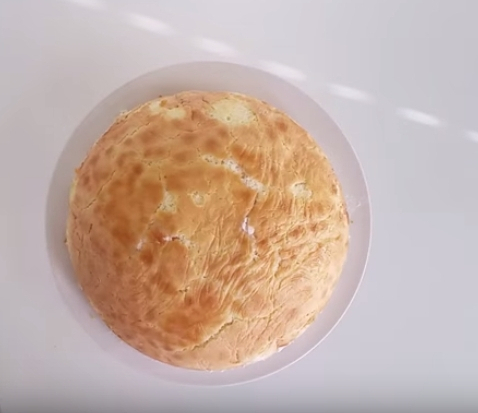 Cut cooled off biscuit cake twice horizontal (you need to have 3 layers). Use a dome-shaped bowl and layer it with plastic foil. Gently press the first biscuit layer into the bowl, so the bowl is completely filled. 5. First spread a layer of plum jam on it, then spread 1/2 of the butter cream on top of jam. Repeat with other layers. 6. Spread plum jam on the short crust and end it with a layer of butter cream. 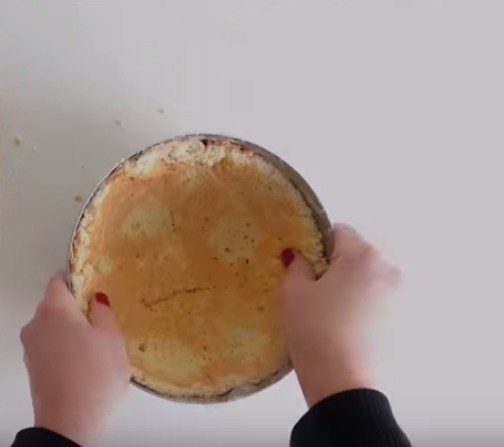 Put on the cake like a lid. 7. Place the cake in the fridge for at least 2 hours. 8. Turn out the cake on a plate. Remove foil. Spread a thin layer of butter cream all around. 9. Chop chocolate and melt in double boiler with coconut oil. Spread the chocolate all around the cake.